'Test Center' is a purpose-built user interface for test case management within Innoslate. Test Center allows for easy test case capture and traceability to requirements, and provides the ability to run test cases within one easy-to-use view. From anywhere within a specific project in Innoslate, you can access 'Test Center' by clicking the 'MENU' drop-down on the top left of the navigation bar, and selecting 'Test Center' under the 'General' heading. For quicker access, you also have the option to pin the 'Test Center' link to your top navigation bar, by clicking the + button next to the 'Test Center' link in the 'MENU' drop-down. 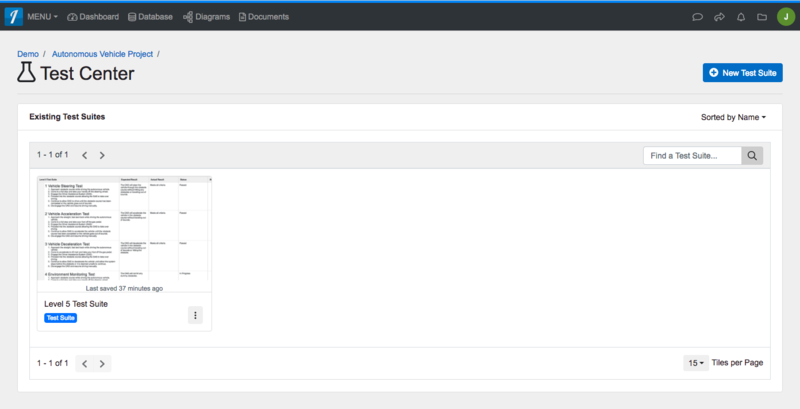 Creating Test Suites Within Innoslate's Test Center, you can create new test suites for your project. Deleting Test Suites Deleting a test suite permanently removes that test suite from your project and deletes all associated data. Renaming Test Suites Renaming a test suite allows you to change the name of an existing test suite so you can better distinguish it from your other documents. Searching for Test Suites Using the 'Find a Test Suite' feature within 'Test Center' allows you to search for an existing test suite by Name, Number or Description. 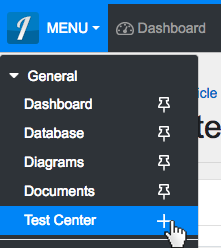 ‘Test Center’ is a purpose-built user interface for test case management within Innoslate. Test Center allows for easy test case capture and traceability to requirements, and provides the ability to run test cases within one easy-to-use view. From anywhere within a specific project in Innoslate, you can access ‘Test Center’ by clicking the ‘MENU’ drop-down on the top left of the navigation bar, and selecting ‘Test Center’ under the ‘General’ heading. For quicker access, you also have the option to pin the ‘Test Center’ link to your top navigation bar, by clicking the + button next to the ‘Test Center’ link in the ‘MENU’ drop-down. Creating Test Suites Within Innoslate’s Test Center, you can create new test suites for your project. Searching for Test Suites Using the ‘Find a Test Suite’ feature within ‘Test Center’ allows you to search for an existing test suite by Name, Number or Description.